The smart wifi door peephle camera is composed of a front door camera and a back LCD screen. It can automatically take photos and monitor 24 hours a day on the security door. These data can be also backed up with WiFi connection. When the visitor comes, you can directly talk to the visitor through the LCD screen at home. If you are out, you can have video intercom with the visitor via APP on smart phones. The Wifi video doorbell can be easily understood as a door camera with wifi connection so that we can know guest via mobile before we open door for him/her. This video wifi doorbell is essential to improve home security. The both transmit through wifi and you can view video outside the door from mobile phone. In addition, functions like motion detection, data cloud storage, and video intercom are the same. The biggest difference between the two is that unlocked can be done on wifi video doorbell via mobile, making manually unlock unnecessary. On the other hand, installation of smart door peephole camera is more complicated, and mostly installed on security door. However, the wifi video doorbell can be directly installed near the door, which is very convenient for house. In addition, they also work on many buildings and underground garages. Below some guide of selecting these two products for your reference. Their function are almost same. The smart door peephole camera is more limited to community house use. Wifi video doorbell is more widely used in high-end residences, villas and buildings. Wifi video doorbell is more convenient in installation. 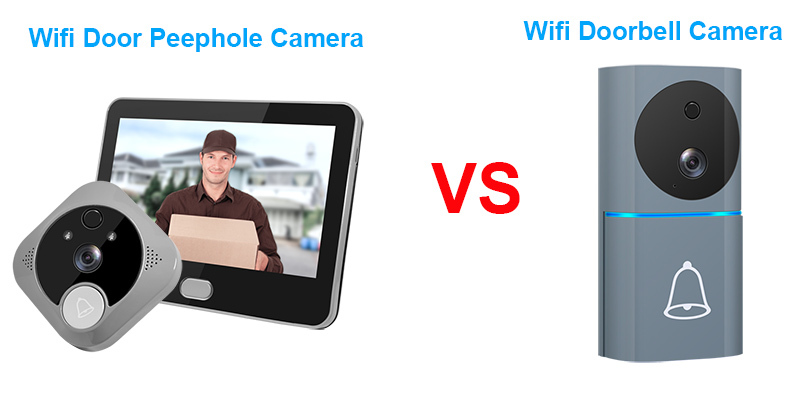 Compared with market feedback of these two products, Wifi video doorbell market is more mature.